Sir Mickey's is located near the entrance to Fantasyland once you go through Cinderella Castle, between Snow White's Scary Adventure and the Fairytale Garden. The shop mainly sells character clothing, hats and souvenirs. 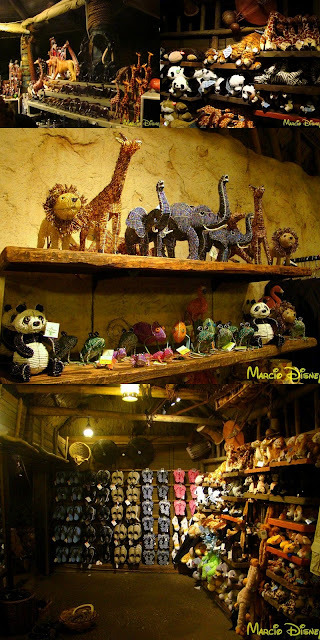 The store is themed after Mickey and the Bean Stalk story. Clothing fit for a king, well at least fit for a knight! Mickey Mouse has a nice little corner in the castle wall and hopes you will not pass it by. 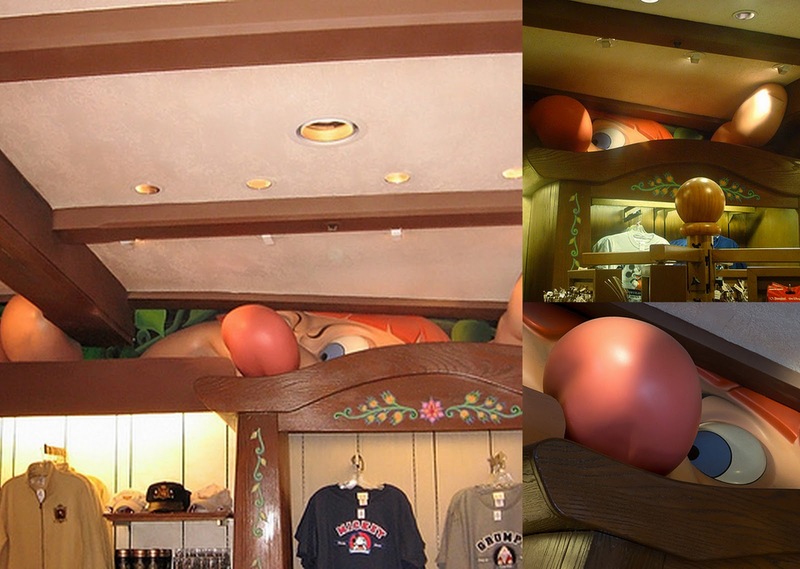 Trivia: Look carefully and you might catch a glimpse of Willie the Giant from the Mickey and the Beanstalk segment of Fun and Fancy Free trying to get IN the store. "To better understand the store and the great themeing, I looked up the 1938 Brave Little Tailor cartoon to which Sir Mickeys is themed. I hope you will view this video and think of it on your next trip to Sir Mickeys in Magic Kingdom! Thanks for coming to Meet the Magic!" "Fantasyland is dedicated to the young at heart and to those who believe that when you wish upon a star, your dreams come true." Sir Mickey's shop in Fantasyland in the Magic Kingdom. Read more about it at the Burnsland Blog. The Epcot Outpost is located between Germany and China in the World Showcase. Technically, it is not a country but if it were, it would be Africa. This small area has a refreshment stand, a shop and even live entertainment for guests to enjoy. 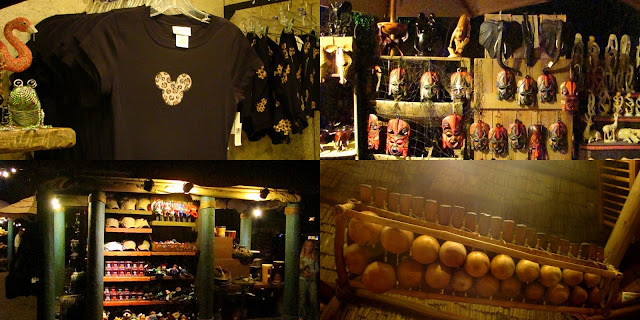 Village Traders - The outdoor market features soapstone sculptures, wood cravings including canes, hats and African masks. Directions: From the entrance pass the large ball of Spaceship Earth and continue on to the World Showcase which surrounds the lagoon. Follow the path left (Mexico) around the lagoon till you pass China and go over the bridge. The shop/stand is on the left. The Refreshment Cool Post offers cold drinks, soft serve ice cream, frozen yogurt, chips and fruit. OrisRisi- is a pair of African storytellers. This couple tells folktales that they heard as children in Nigeria. The storytelling includes the playing of the drums which most people find hypnotic. Children especially love the drums. This duo is very entertaining, as they should be. He is a music researcher and a folklorist and she grew up hearing the stories that they share with park guests. The two of them together are very animated and very good storytellers. Be sure to check a times guide for specific performance times. Kids should stick around after the storytelling is over for a chance to play the drums. Click Here to see the menu (and price) and click here to see family photos at this location! 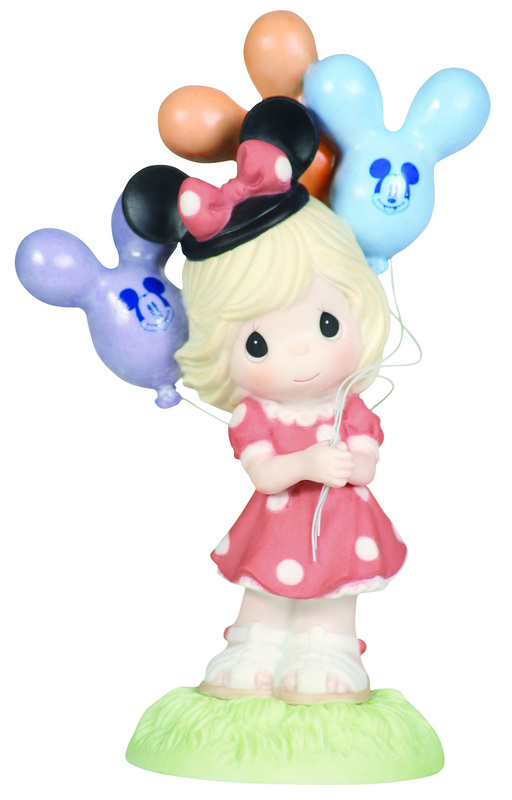 Since 2005, Disney Theme Park Merchandise has partnered with Precious Moments to created special figurines that are unique to Disney Parks. To celebrate the release of the newest Disney Theme Park Exclusive collectible from Precious moments, I caught up with Deb Butcher. Deb grew up right along with Precious Moments. Her father, Sam Butcher, created Precious Moments before she was 10 years old. As an artist’s daughter, Deb was entrenched in the world of mixing paint, exploring color and absorbing the full meaning behind Sam’s creations. Today, Deb is responsible for the direction of the Precious Moments creative team, from concept creation through the approval process of art. She works closely with the artists and product developers to ensure that every Precious Moments figurine and gift conveys her father’s message, while offering meaning and beauty to the end consumer. I had the opportunity to talk with Deb to find out more about the creation of Precious Moments and the partnership with Disney. Dara: For more than 30 years and with more than 1,500 figurines to your father’s credit, did you think he ever imagined that from the “Original 21” figures, Precious Moments would become one of the world’s leading collectibles? Deb: When he was creating the first 21 his desire was to touch someone’s life in a personal way. He wanted to celebrate, inspire and provide comfort. At no time did my dad discuss Precious Moments as “the next big thing,” or an opportunity or think that it would be a collectible that is cherished around the world. He really just wanted to give people a way to express what they were feeling but didn’t have the words to say. Dara: Children play a prominent role in each of the Precious Moments figurines. The teardrop-eyes of the children in Precious Moments figurines are recognized around the world. What meaning do the teardrop-eyes have for you and the Precious Moments family? Deb: The teardrop-eyes are the result of how my dad saw children, with big innocent eyes. Many people have commented that my son Colin and I resembled Precious Moments when we were younger. It’s just how Dad sees children, full of innocence. Dara: Disney and children go hand in hand so it’s no surprise that the collaboration with Precious Moments and the Disney Showcase Collection has been a success. With so many Disney characters to work with, how do you select the subject for each piece? Deb: Disney has a deep emotional connection with its Guests and Precious Moments has childhood innocence so it’s a perfect fit. As far as selecting a subject, the scenarios just seem to create themselves. Together we are creating recognizable memories that will last a lifetime with their recipients. 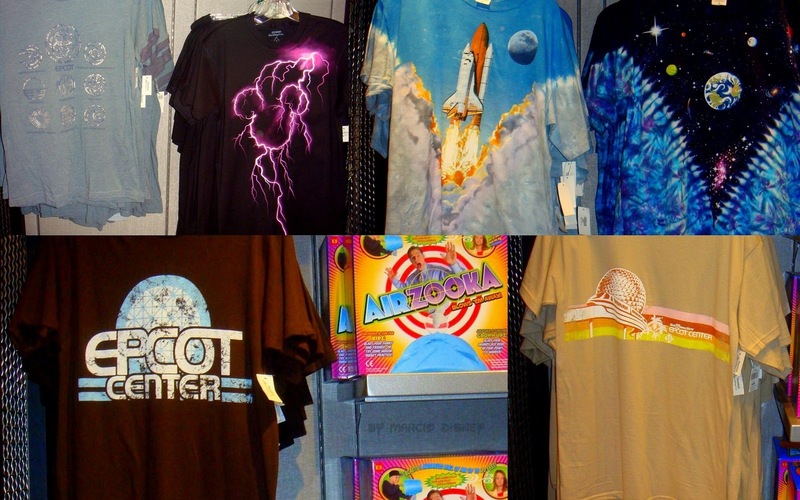 Dara: Do you have a favorite piece from the Disney Showcase Collection? 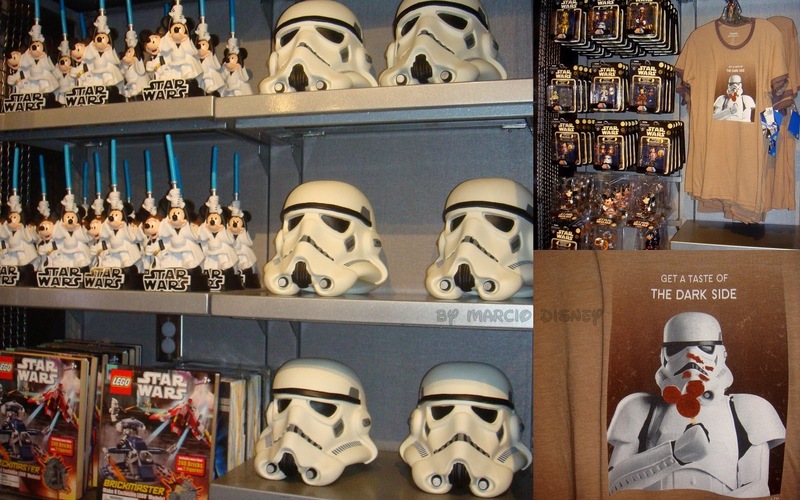 Deb: This is a really difficult question because there are so many adorable figurines! But, I must admit Pooh has always been my favorite character, so “Everything’s Better With Friends” with the little boy reading to Pooh and Piglet in the chair would have to be one of my favorites. It reminds me of when we were small and my Mom would read stories to us from The Hundred Acre Wood. If you would like to ask Deb Butcher a few questions of your own, you’ll have a special opportunity to meet her on March 25 and 26 at Walt Disney World Resort. Deb will be signing the newest Precious Moments figurine from the Disney Theme Park Collection: “It’s Always a Day in the Parks with You.” Deb will be appearing at the Art of Disney in Downtown Disney Marketplace on March 25 from 4:00 p.m. – 6:00 p.m. and at Uptown Jewelers in Magic Kingdom on March 26 from 11:00 a.m. – 1:00 p.m. and 4:00 p.m. – 5:00 p.m. If you’re going to be at Disneyland Resort next weekend, you can meet Master Sculptor for Precious Moments, Hiko Meada on March 26 at Off the Page in Disney California Adventure park from 11:00 a.m. – 2:00 p.m. and World of Disney in the Downtown Disney District from 4:00 p.m. – 7:00 p.m.
Saint Patrick's Day is a religious holiday celebrated internationally on 17 March. It is named after Saint Patrick (c. AD 387–461), the most commonly recognised of the patron saints of Ireland. It originated as a Catholic holiday and became an official feast day in the early 17th century. It has gradually become more of a secular celebration of Irish culture. The hat has a retail of $14.95, and is the perfect accent to your St. Patrick’s Day outfit. 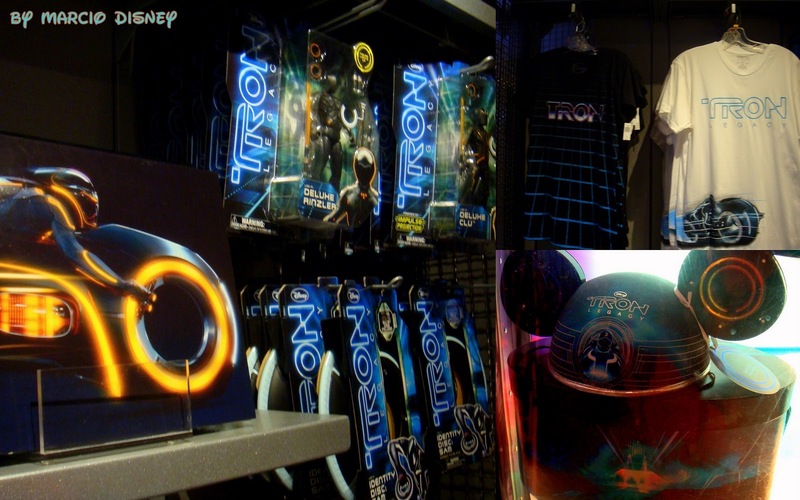 It can also be found on the Disney Parks on-line store. Erin go bragh! It means Ireland Forever. You won't get pinched on St. Paddy's Day wearing this green St. Patrick's Day 2011 Mickey Mouse Ear Hat. 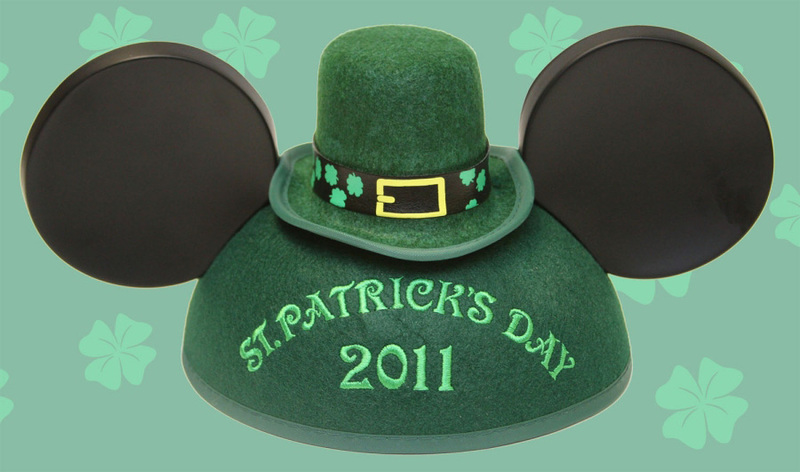 A little leprechaun hat sits between Mickey's ears and ''St. 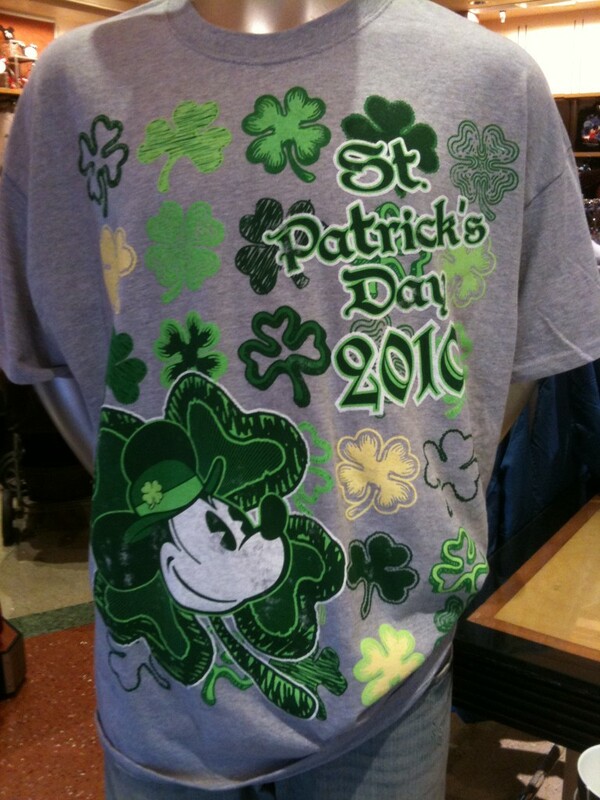 Patrick's Day 2011'' is embroidered on front. W h y G r e e n ? Originally, the colour associated with Saint Patrick was blue. Over the years the colour green and its association with Saint Patrick's day grew. Green ribbons and shamrocks were worn in celebration of St Patrick's Day as early as the 17th century. He is said to have used the shamrock, a three-leaved plant, to explain the Holy Trinity to the pagan Irish, and the wearing and display of shamrocks and shamrock-inspired designs have become a ubiquitous feature of the day. In the 1798 rebellion, in hopes of making a political statement, Irish soldiers wore full green uniforms on 17 March in hopes of catching public attention. The phrase "the wearing of the green", meaning to wear a shamrock on one's clothing, derives from a song of the same name. Top o' the mornin' to you! 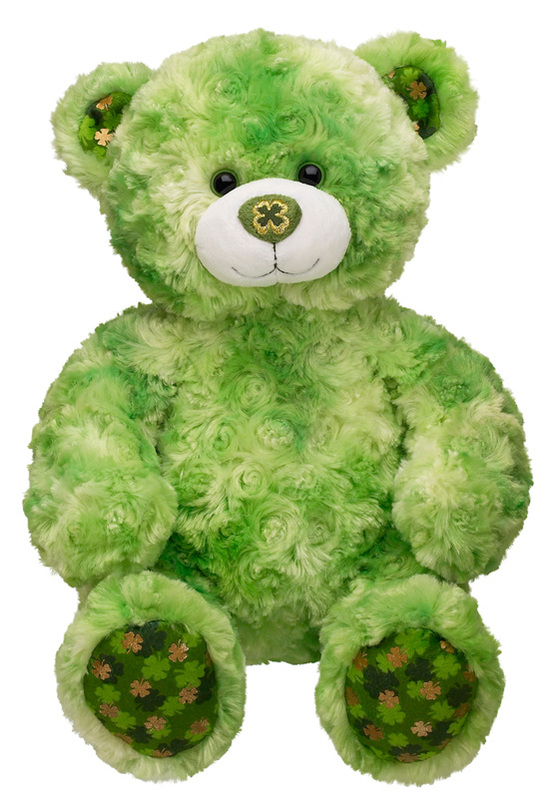 Celebrate March 17th with pie-eyed Mickey who's dressed up in traditional green on this St Patrick's Day Mickey Mouse Plush Toy. 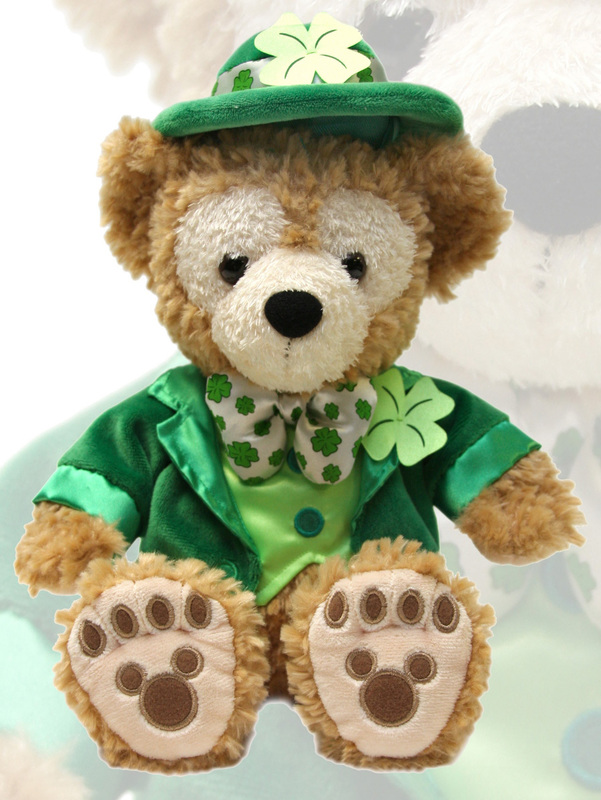 He even has a four-leaf clover in his hat so with luck you'll give him a nice big hug! 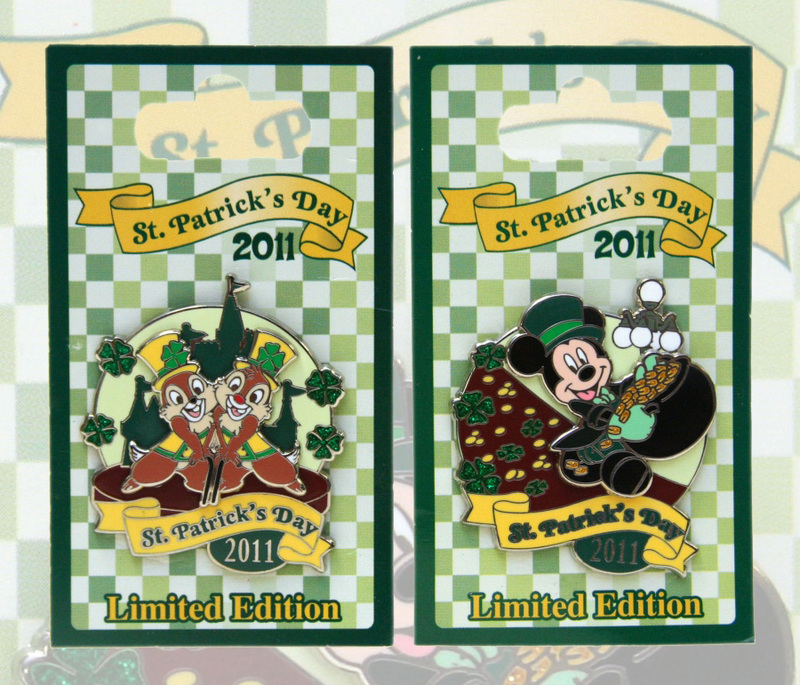 Look who found your pot of gold -- it's Mickey on this 2011 St. Patrick's Day Leprechaun Mickey Mouse Pin. Glittering gold and four-leaf clovers add sparkle and a touch of Irish charm to this limited edition pin. Being an alien, Stitch doesn't have much in the way of Irish roots, but that doesn't stop him celebrating the patron saint's day on March 17th with this glittering St Patrick's Day Stitch Pin. Ready to be Irish for the day? The Downtown Disney District is preparing to celebrate St. Patrick’s Day on March 17 with special entertainment, kids activities, food specials and lots of green. 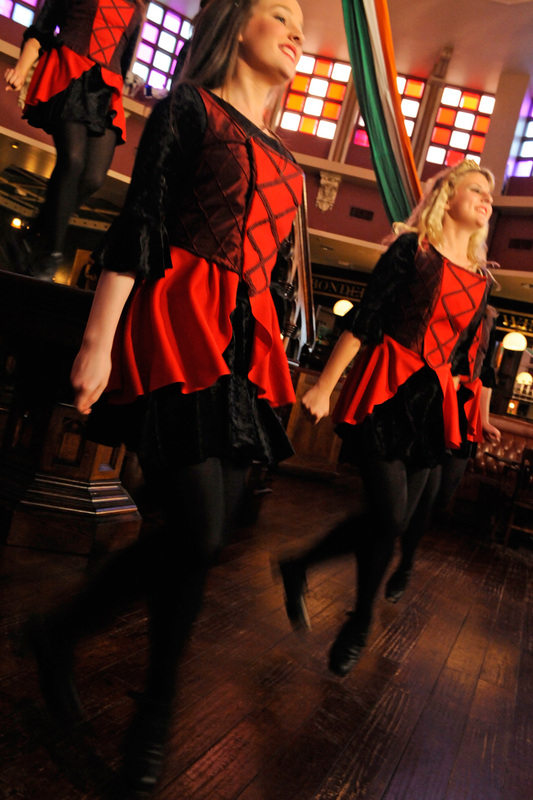 Traditional Irish music, along with folk and rock tunes, will set the mood. With this much fun, you just might want to pinch yourself! Not party-ready when you arrive? 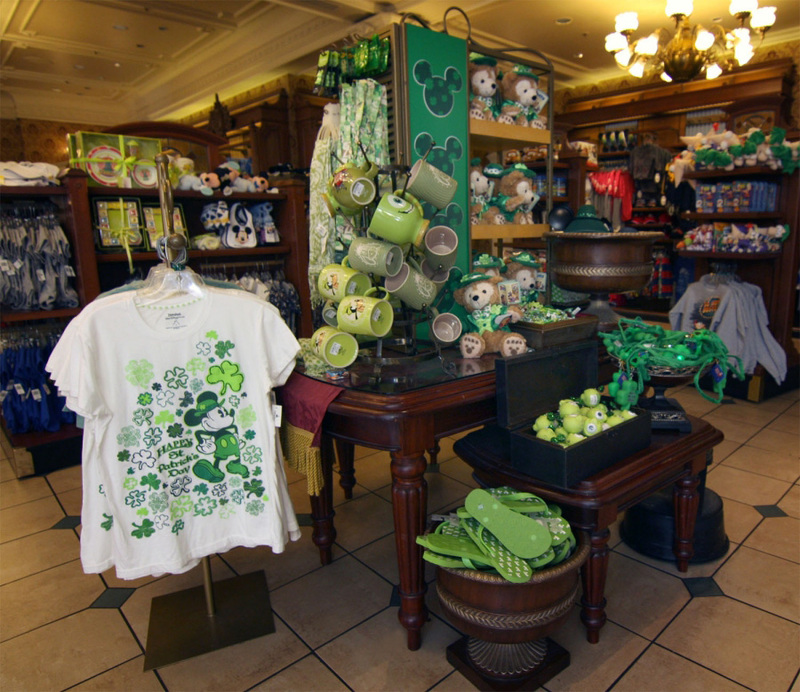 Before you get pinched for not wearing green, hurry to one of the many merchandise carts set up throughout Downtown Disney and grab a green feather boa or novelty bowler hat, beads and other colorful accessories for the party. The festive atmosphere kicks into overdrive when the high energy Irish folk band Shillelagh delivers spirited songs accompanied by accordion, fiddle, and percussion on the District’s main stage at the ESPN Zone. Ralph Brennan’s Jazz Kitchen along with the ESPN Zone, House of Blues, Catal, Tortilla Jo’s and La Brea Bakery are all offering St. Patrick’s Day drink specials including Irish whiskey, themed martinis, margaritas and, of course, green beer. Not to be outdone, Uva Bar will feature a special menu throughout the week leading up to March 17 along with drink specials and an assortment of Irish beers. We’ve been told that even the hosts and hostesses will be getting into the act, but we don’t want to give away all their surprises. Your little leprechauns can be set loose to find the Downtown Pot ‘o’ Gold in a fantastic treasure hunt. If they’re lucky enough to find the hidden clovers throughout Downtown Disney District, they could win prizes and maybe even a gold doubloon or two. Need more great reasons to follow this rainbow? Build-A-Bear Workshop and the LEGO Store will both have special four leaf clover activities and merchandise available while Kaman’s Art Shoppe will offer themed face painting and henna tattoos for adults and children.